John South is a descendant of the Barkindji people of north west NSW, who was born and raised in the Blue Mountains west of Sydney. He is a painter who has held a number of solo exhibitions since 1996. He was a finalist in the 2006 and 2007 Parliament of NSW Indigenous Art Prize He earned degrees in the fine arts and is completing his PhD on Aboriginal Astronomy at Western Sydney University. 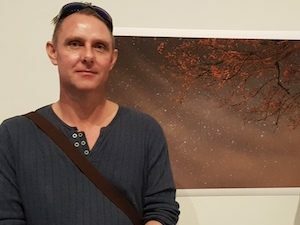 The SKYWORLD art exhibition in Katoomba is a creative component of his thesis.